Amazon and Facebook announced today a new partnership, using Facebook Connect, that combines the best of both companies. You can buy lots of stuff on Amazon for people you know on Facebook! It’s a smart move from Amazon, the latest in its “Web 3.0” changes. The partnership manifests itself in a totally opt-in system on Facebook, which is a good choice, seeing as how Amazon will have access to all kinds of information about you if you opt in, which not everyone will want. Amazon is being very careful about privacy here, saying that they will neither contact any of your Facebook friends nor reveal account (purchasing) history. 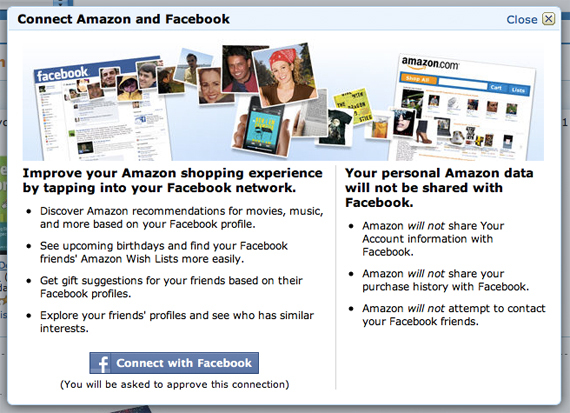 The new recommendations will also show upcoming birthdays and link right to the Amazon Wish Lists of Facebook friends. It’s a really good idea, one I’m surprised hasn’t been implemented already. Now the only thing that’s left is for enough people to opt in–without lots of users, it won’t be nearly as useful.